Marinate the shrimp in lemon juice for 30 minutes. Combine flour, cornstarch, and salt in a mixing bowl then mix well. Add the eggs and milk stir until all the ingredients are well distributed. Heat a pan and pour-in the cooking oil. 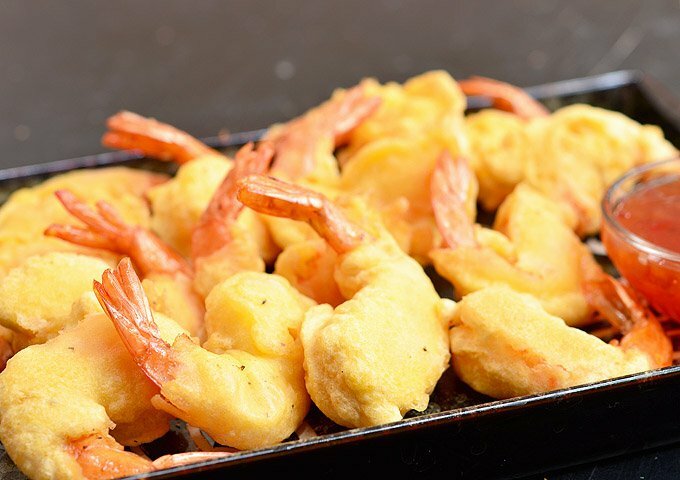 When the oil is hot enough, dip a piece of shrimp in the batter (leave the tail uncovered) then deep-fry until the color of the outer part turns dark yellow and the texture becomes crispy. Remove from the pan or fryer then place in a plate with paper towel (this will absorb excess oil). 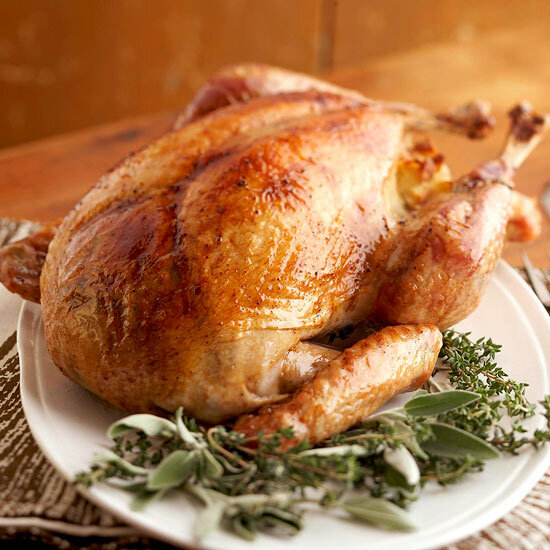 Clean the turkey by placing under running water while gently rubbing the skin and cavity. Drain and pat dry with a paper towel. Combine butter, sage, thyme, salt, and pepper. Mix well. Place half of the butter mixture in between the skin and the meat of the turkey. Do this by creating an incision on the lower breast and then insert your finger to separate the skin and meat. Arrange the chopped celery and rosemary inside the cavity of the turkey and then tie the end of the legs together using a kitchen twine. Brush the remaining butter mixture all over the turkey. Place the turkey in a roasting rack and then put-inside the oven. Roast for about 20 minutes and then pour water on the roasting pan. Reduce the temperature to 350 degrees Fahrenheit. Cover the turkey with aluminum foil. Continue roasting for 1 hour and 30 minutes. Remove the foil and then roast the turkey for 30 to 45 minutes more. Arrange in a serving plate. Serve with turkey gravy. Combine the flank steak with the flank steak marinade in a large bowl. Cover the bowl and place inside the refrigerator. Marinate for 1 to 3 hours. Lay the marinated flank steak in a plate. Assemble the stuffing in the middle. Start by lining the carrot sticks, sweet pickle sticks, sliced chorizo, and egg. Make sure that the stuffings are close to each other. 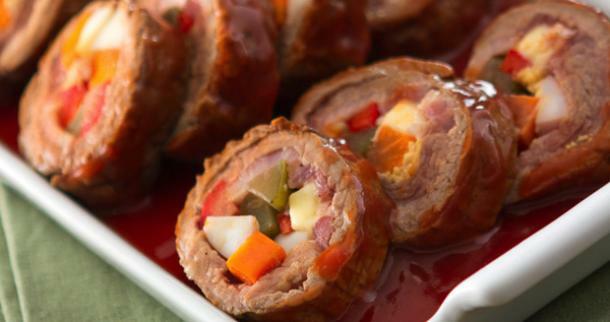 Roll the flank steak from one end to another to cover the stuffing. Use a kitchen twine to tie the meat. This will seal the stuffing inside. Meanwhile, heat the oil in a frying pan. 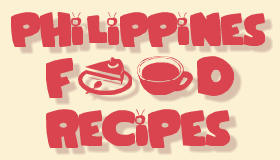 While the oil is starting to heat-up, dredge the rolled flank steak (morcon) in flour. Make sure that the entire piece is coated. Pan fry the morcon until the outer part turns light to medium brown. This should be around 2 minutes per side. Remove the pan-fried morcon from the frying pan. Arrange in a wide cooking pot and pour-in water, soy sauce, and beef broth. Heat the cooking pot and let boil. Cover and simmer for 60 minutes or until the meat gets tender. Slice the beef morcon into serving pieces and arrange in a serving plate. Pour the sauce on top.